Yvonne Ryves, the author of Shaman Pathways - Web of Life sent me a scan of this picture she drew of her own personal web of life. Her book explains how you can create one for use in personal pagan spiritual work. The circle divided into quarters, the medicine wheel or hoop, and the web of life are central concepts in many traditions including Wicca, Celtic and Native American teachings. The idea is that the circle is a sacred space. Within it directions are called upon for protection or aid when doing ritual work. 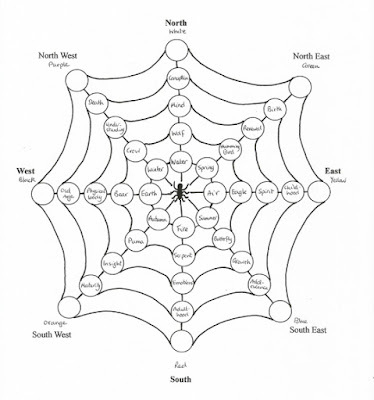 The directions can be east, south, west and north; they can be land, sea and sky; or above and below or other variations. Often they are given characteristics such as the elements of air, fire, water and earth; or spring, summer, autumn and winter. They might then have deities, angels or animal spirits associated with them that can offer appropriate guidance to the seeker. The problem is, although the systems often have similarities, they aren’t consistent – and there is no reason they should be. Different people in different parts of the world with different land features, weather patterns, seasons and wildlife would experience the earth in different ways. 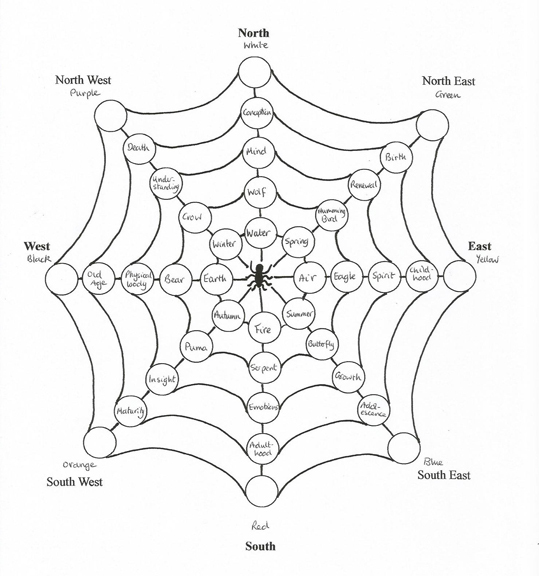 If one system says that the east is represented by the element air and the colour blue, another says it is represented by the fire of the rising sun and the colour yellow, while a third sees east as the home of the eagle spirit and the powers of the feminine, that is perfectly natural. Yvonne Ryves...offers a method of finding out the way of working that is right for you. This involves creating your own medicine wheel – or web of life – on which you place those teachers, elements and symbols that resonate for you. I'm always delighted to be sent photos and pictures to post on my blog. On each Pagan Eye post, I show an image that I find interesting, with a few words about it. The picture can be a seasonal scene, a pagan site, an event, or a scan of something you have created or drawn, like this web of life picture.